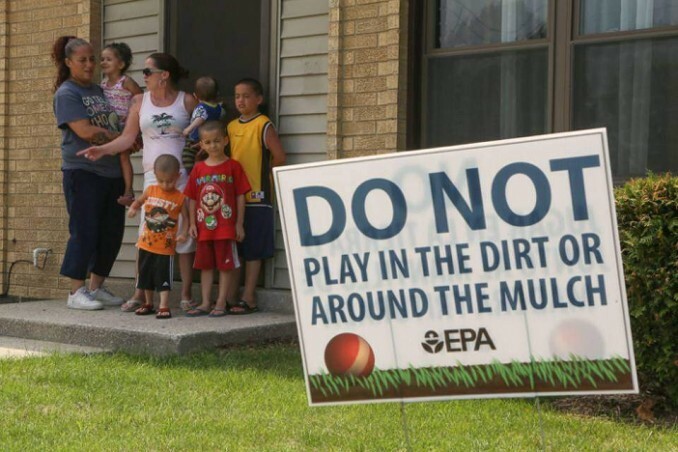 Hundreds of children living in the West Calumet housing projects in East Chicago, Ind., have tested positive for excessive levels of lead in their blood. They have played in topsoil containing up to 30 times more lead than safety levels established by the U.S. Environmental Protection Agency. The complex houses 1,100 low-income, mostly African-American people. It lies atop the toxic remains left by companies like Anaconda Lead Products and is near the huge U.S. Smelter and Lead refinery. The complex was built in 1972 in what was once known as the most industrialized city in the United States. It is now a bitter example of deadly environmental racism. The area’s soil was repeatedly tested for lead in 2008, 2011 and 2014, but results were not released until July. The soil also contains hazardous levels of arsenic. The lead contamination is much worse and deeper in the soil. In July, residents were suddenly told that their homes will be demolished, their elementary school will be closed, and they will have to relocate. But many residents don’t have the money to pay moving expenses or make down payments in a city with scarce housing. Some will be forced to move to an old vacated project called Harborside, located out of town in North Harbor. The EPA gave West Calumet “Superfund” status in 2009 and started to remove topsoil in a few “hot spots.” The EPA Superfund is responsible for cleaning up major land contamination and responding to environmental disasters. Since June, the EPA has warned families to stop children from playing in the soil. It spread mulch on contaminated ground and offered “deep cleaning” to families. But these acts are token safety measures when the soil below is so badly contaminated. Angry residents have organized a group called Calumet Lives Matter. They are demanding answers about why it took so long to be told how dangerous the soil was. Black Lives Matter, several environmental groups, National Nurses United and Northwestern University’s environmental law clinic are all supporting the residents. West Calumet residents have filed a housing discrimination complaint with the National Center on Poverty Law in Chicago. It claims East Chicago’s relocation plan violates federal civil rights laws. Lead is stored in bones, so adults exposed throughout their lives can suffer from cardiovascular disease, tooth decay, miscarriages, kidney disease, mental decline and cataracts. Pregnant women with stored lead risk poisoning their babies since lead leaches from the bones into the blood and the uterus. Lead poisoning fuels the school-to-prison pipeline for at-risk children who live in low-income communities. Some children are born with inherited lead poisoning, a disadvantage that makes it even harder for a person to survive, especially in a capitalist country like the U.S. where social programs have been cut to the bone and the killer brutality of police toward Black people is a terrifying epidemic. In 2000, Congress allocated $2.1 billion over the next 10 years to eliminate lead poisoning. But that insufficient amount has fallen by 43 percent since 2003. Money for lead testing in children has also been cut by 40 percent. The Pentagon war budget and the cost of prisons, however, have steadily increased. A 2009 study calculated that every dollar spent on preventing lead poisoning would generate up to $221 in benefits — in increased productivity and lower health care and education costs.